Food Chain Niv is an aggressive combo deck angled on speed, consistency, and resistance to disruption. The primary idea is to use Food Chain and either Eternal Scourge , Squee, the Immortal or Misthollow Griffin to generate infinite mana, then cast, exile, and recast Niv-Mizzet Reborn to search up a multicolored outlet for converting the resources generated by Food Chain into a win. It layers with a combo between its exile tutors ( Demonic Consultation ) and Laboratory Maniac which gives the deck another axis to pivot around disruption or being disrupted. It is built on a shell of mana-producing creatures that fuel its combos, backbreaking card advantage engines, and a plethora of tutors -- several of which find its entire combo via a single instant-speed spell. It has access to all five colors, yielding a powerful and flexible interaction and removal suite and the ability to evolve to the metagame it finds itself in. It is resistant to many forms of stax and spot removal, while playing outs to effects it must remove and protective countermagic to force the resolution of its combo. Present are many powerful synergies, such as utilizing cards where exiling was designed as a penalty, e.g. Necropotence , Demonic Consultation , Tainted Pact , Chrome Mox , Gemstone Caverns , etc. The to-exile tutors, such as Manipulate Fate, are likewise extremely efficient at their function, being cheap to cast while also maintaining card parity. Check out the budget build! To execute the combo: cast Food Chain , exile your utility creatures for FC mana, cast Eternal Scourge , exile for mana. Repeat for infinite FC mana. Cast and exile Niv-Mizzet Reborn until you've fetched your outlets. If you have Hydroid Krasis , cast it to draw the rest of your library and win with Laboratory Maniac . If you have Sparkcaster , cast and return it for unbounded targeted damage. If you have Circu, Dimir Lobotomist , cast it, then exile and recast Niv for unbounded library exile. The deck is very good at producing a win from an empty boardstate, needing approximately 3 mana and a creature (or excess mana) to pay for its win (FC + starting the chain). The deck is modular; it can be adapted to the context of a meta by slotting in powerful custom interaction to stifle opponents while reaching toward its own goals. The rest of the deck is filled with support cards of various colors; there is plenty of room for tutors, mana sources, and interaction. Having access to 5 colors allows the deck to access the most efficient options from any color. With 9 fetchlands, a selection of ABUR duals, and the best multicolor lands, hitting your color requirements is very easy. In mulligans, it's important to see a 1 drop creature and a path toward the combo in the form of tutor or draw. Mull aggressively for hands with an active plan. This is one of the more obvious patterns -- you have half the puzzle and some mana and just need to tutor the rest. Be careful not to get trapped into over-tunneling on these types of hands; they're often fast but risky and leave you scrambling to recover if you're disrupted. But if life gives you the nuts, don't be afraid to make peanut butter. This is an attractive plan in scenarios where you've got fast mana rituals, a tutor, and are looking to rush out a win or slip between a light amount of stack-based disruption at instant speed. It also is a very attractive game plan against non-blue decks that levy permanent-removal in lieu of counterspells, as once Naus resolves, your combo will be very well-protected. The deck is quite capable of a main-phase Naus, but end-of-turn will always be more secure. Going for Necro in the early-mid is a strong strategy if you need to take a cycle or two to exhaust interaction and ramp a bit. All-in on Necro also has the ability to win games that are worn on interaction, but remember that your 7 cards needs to both survive the pass and combo. Typically in the early game, an initial Necro of ~15 is prudent for initial selection, with subsequent Necros being tailored to the tempo necessary to strongarm the rest of the players into submission and execute the combo. Later-game Necros will normally plan to only pass the turn cycle once, so dig deep. Keeping hands that lean on incremental draw like Mystic Remora , Sylvan Library , Dark Confidant , etc. are strong when you're planning on going into the long game against control/stax decks. These pieces are innocuous enough to not draw countermagic early while setting you up to sculpt into a winning hand when an opportunity opens up. However, this strength comes with some inherent risk. Demonic Consultation has approximately a 6.66% chance of exiling Food Chain from the top 6 cards of a 90 card library. If Circu, Krasis, Sparkcaster and Laboratory Maniac are exiled, it becomes very difficult to win the game. There is around 45% chance to exile cast-from-exile without exiling all wincon outlets in search of Food Chain. There is a 33.3% chance that Food Chain is on top both CFE creatures (thus missing them both) and a 25% chance that it’s under all 3 wincon outlets, so there is a 9/20 chance for the ideal outcome to occur with your Forbidden Tutor. Manipulate Fate , Foresight , Extract exile Eternal Scourge , allowing you to access a combo half as if it were in your hand. The exile 3 are very efficient because you can exile your Foresight / Extract with your Manipulate Fate together with your Misthollow and Scourge, so you won’t end up drawing it later. Necropotence is a powerful engine in the deck, allowing you to dig, stabilize, and conveniently exile a CFE creature without taking up hand space. A very worthy option if you have a tutor and nothing else going your way. Chrome Mox and Gemstone Cavern can exile a CFE from your opener, mitigating the card loss. Force of Will pitches Misthollow Griffin . Plunge into Darkness exiling a CFE turns it from a really big Impulse into a really big Dig Through Time . Mana dorks are the most efficient form of ramp for the deck, as they can be exiled to Food Chain for mana to cast a CFE, or even pitched from your hand while chaining. With the deck being 5-color, you have access to every possible 1-drop mana-producing creature. 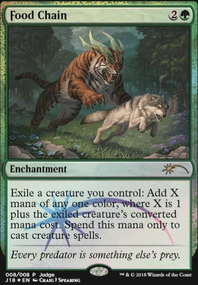 This importantly results in openers that often facilitate having 3 mana on the second turn, and the ability to exile creatures from board and hand for "free" CFE creatures when you are executing a combo with Food Chain. The deck plays cantrips like Preordain , Ponder , Brainstorm and Gitaxian Probe to dig in the early game and to get more use out of Imperial Seal , Enlightened Tutor , Mystical Tutor , Vampiric Tutor in the late game or after Ad Nauseam or Necropotence. While the deck is very reliant on Food Chain, getting your Chain countered is not the end of the world. The deck (depending on variation) runs Yawgmoth's Will , Regrowth , Noxious Revival and Timetwister , for lines to get back Food Chain. With the deck's tutor and dork density, it's often likely to win after resolving a Timetwister -- exiled CFE won't be shuffled back, leaving you in a decent position to recover and win. If you've been disrupted and recursion lines seem out of reach, you can move toward assembling a combo of Laboratory Maniac, Demonic Consultation or Tainted Pact and a draw. Knowing when to pivot to this line is an important skill that comes with practice. In a situation in which you are behind with a tutor and nothing else to do, tutoring Necropotence goes a long way to helping you recover. You can play to the speed you need, while also having a very convenient outlet to discard your Scourge, while accruing elements you need to attempt to win the game. This deck has a versatile suite of responses to deal with the stax pieces that are typically the bane of fast-combo decks. The most threatening stax for this deck are Rule of Law effects, Sphere of Resistance effects, and Torpor Orb . Toxic Deluge , Nature's Claim , Chain of Vapor , and Cyclonic Rift are your best answers to unfortunate boardstates. Many common stax pieces are relatively easy to play around. Linvala, Keeper of Silence and Cursed Totem only shut off dorks. Winter Orb isn't terribly impactful against low-land decks. Niv is unaffected by Containment Priest . Rest in Peace only shuts off possible Yawgmoth's Will lines and implores you to be more careful with Food Chain. Trinisphere and Thorn of Amethyst are painful to set up through, but don't stop the execution of the combo. It is important to note that cards like Demonic Consultation , Tainted Pact , Plunge into Darkness and Lim-Dul's Vault are unaffected by cards like Aven Mindcensor or Stranglehold . This deck plays around Gaddock Teeg essentially by default. Additionally, the deck is unafraid of creature and artifact removal, as well as sorcery-speed interaction of most types, as it can generate wins from an empty boardstate without much effort. The most threatening interaction is instant speed enchantment removal and bounce. This deck can also play some interesting hatebears of its own as an optional package. Flash hatebears like Containment Priest and Aven Mindcensor can be flashed in to reap their effects, sowing 3 or 4 mana on the next turn after untapping. Any harmful creature stax effect could be sacrificed to FC to lift the effect when Niv is ready to win, if such a need would arise. In many matchups where you feel like you have to slog through too much resistance or you need to win versus strong hate pieces like Eidolon of Rhetoric , you can always go through Ad Nauseam . Resolving end step Nauseam when your opponents have you already counted you “out of the game” is great way to steal a victory. If you are resolving a Tainted Pact in search of a CFE creature, remember to keep going until you either see your last wincon outlet or a protection spell like Force or Pact of Negation. This deck is very green reliant between dorks and FC cost. It is very risky to keep a hand without a reliable green source. You strongly desire to see a tutor and a ramp piece in your opener. A good rule of thumb is that if you resolve a Necropotence with 35+ life, it's usually strong to necro for approximately half your life total each turn. This gives you strong dig and acceleration while also having a safety net in case you are disrupted. Plunge into Darkness is best when cast for 10+, but be sure to weigh your need to trade life for card advantage afterward. Ad Nauseam should be cast with the intent to win shortly after. Stopping around 4 to 8 life is usually ideal so you have life to pay for tutors, Probe, mana, etc. You can play Silence in an opponent’s upkeep, and then follow it up with an Ad Nauseam in their end step. People might be hesitant to counter an upkeep Silence. Silence is also an important tool when playing around Abrupt Decay . Upvote Niv and revel in the infinite love.